At Vrisi 36, we pride ourselves on offering a line of olive oil, balsamic vinegar and Mediterranean mustard you’ll feel good about putting on your dinner table. Between partnering with local Greek farmers and keeping the production process as simple as possible, we’re able to deliver a product that not only tastes great, but is great for the health of you and your entire family. We like to know where our food comes from, and we think you should, too. Managing our own supply chain allows us to control the entire production of our olive oil, from farm to bottle. We have our hands in every step of the process — figuratively, of course — ensuring that our products are made just the way they should be. Hand picked, freshly pressed, all natural and all Greek. After all, we’re born this way. So what’s so special about Greek olive oil? There’s a reason Mediterranean food relies so heavily on olive oil — it’s been a part of the Greek diet for thousands of years. Greek olive trees are some of the oldest in the world (between 500 and 2,500 years), which means their fruit is particularly full of free radical-busting antioxidants and countless other benefits. For example, the Koroneiki olive, a variety of olive that originated in the Mediterranean, not only offers a beautifully rich taste and aroma, but an extremely high content of antioxidant-rich oleic acid and polyphenols as well. It’s why a majority of products from the Vrisi 36 line feature Koroneiki olives. Despite these benefits, very few olive oils originate from Greece. Vrisi 36 has been fortunate enough to foster a number of partnerships within a small, Greek olive farming community in order to bring authentic olive oils and related products to the United States. Unlike many imported olive oils, Vrisi 36 has only one country of origin — we’re 100% Greek. 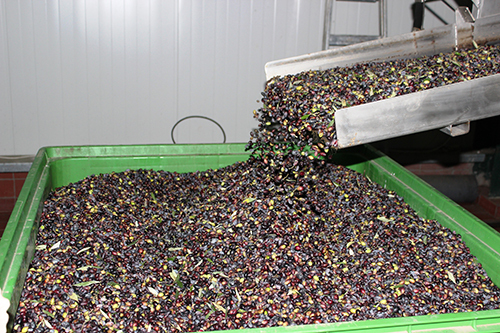 This means that every step of our production process, from picking to pressing to packing, takes place in Greece. Once our olive oils are packed, they’re shipped straight to us and put on the shelves for you to enjoy. Find our 100% Greek olive oil and other products at a store near you, or contact us to learn how to get Vrisi 36 into your own store.